Three atmospheric processes modify the solar radiation passing through our atmosphere destined to the Earth's surface. These processes act on the radiation when it interacts with gases and suspended particles found in the atmosphere. The process of scattering occurs when small particles and gas molecules diffuse part of the incoming solar radiation in random directions without any alteration to the wavelength of the electromagnetic energy (Figure 7f-1). Scattering does, however, reduce the amount of incoming radiation reaching the Earth's surface. A significant proportion of scattered shortwave solar radiation is redirected back to space. 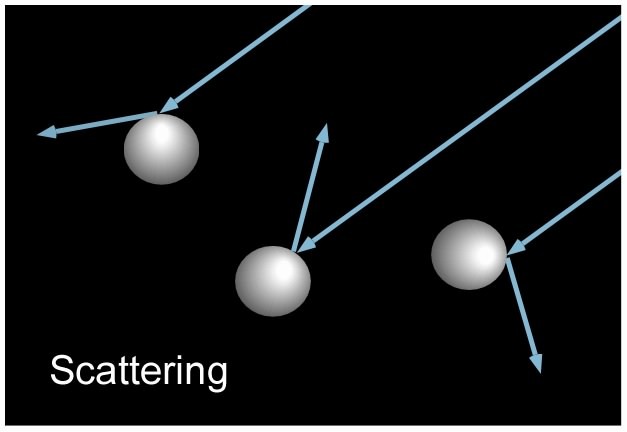 The amount of scattering that takes place is dependent on two factors: wavelength of the incoming radiation and the size of the scattering particle or gas molecule. In the Earth's atmosphere, the presence of a large number of particles with a size of about 0.5 microns results in shorter wavelengths being preferentially scattered. This factor also causes our sky to look blue because this color corresponds to those wavelengths that are best diffused. If scattering did not occur in our atmosphere the daylight sky would be black. Figure 7f-1: The process of atmospheric scattering causes rays of sunlight to be redirected to a new direction after hitting a particle in the atmosphere. In this illustration, we see how three particles send light rays off into three different directions. Scattering does not change the striking light ray's wavelength or intensity. 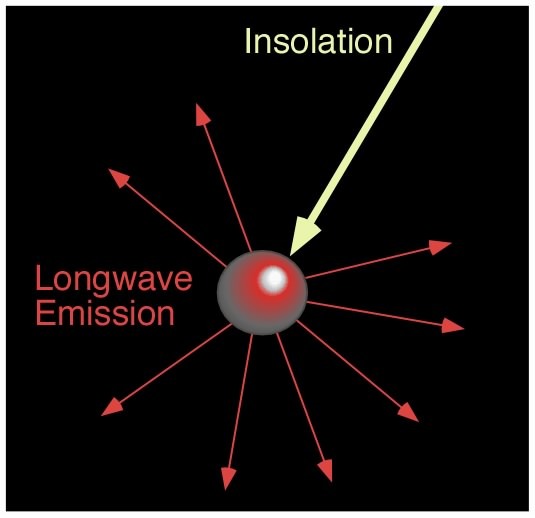 If intercepted, some gases and particles in the atmosphere have the ability to absorb incoming insolation (Figure 7f-2). Absorption is defined as a process in which solar radiation is retained by a substance and converted into heat energy. The creation of heat energy also causes the substance to emit its own radiation. In general, the absorption of solar radiation by substances in the Earth's atmosphere results in temperatures that get no higher than 1800° Celsius. According to Wien's Law, bodies with temperatures at this level or lower would emit their radiation in the longwave band. Further, this emission of radiation is in all directions so a sizable proportion of this energy is lost to space. Figure 7f-2: Atmospheric absorption. In this process, sunlight is absorbed by an atmospheric particle, transferred into heat energy, and then converted into longwave radiation emissions that come from the particle. The final process in the atmosphere that modifies incoming solar radiation is reflection (Figure 7f-3). 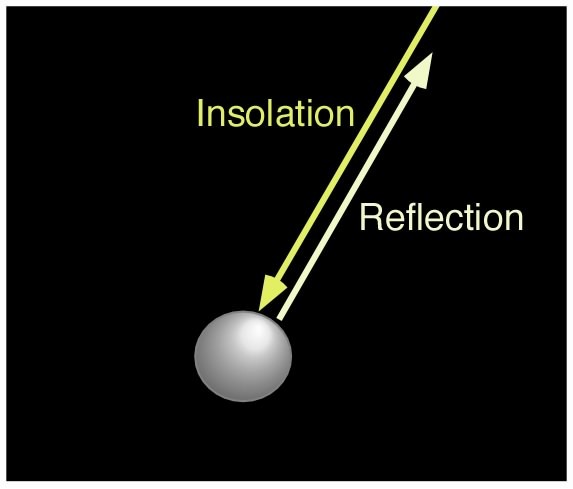 Reflection is a process where sunlight is redirect by 180° after it strikes an atmospheric particle. This redirection causes a 100% loss of the insolation. Most of the reflection in our atmosphere occurs in clouds when light is intercepted by particles of liquid and frozen water. The reflectivity of a cloud can range from 40 to 90%. Figure 7f-3: Atmospheric reflection. In this process, the solar radiation striking an atmospheric particle is redirected back to space unchanged. Sunlight reaching the Earth's surface unmodified by any of the above atmospheric processes is termed direct solar radiation. Solar radiation that reaches the Earth's surface after it was altered by the process of scattering is called diffused solar radiation. Not all of the direct and diffused radiation available at the Earth's surface is used to do work (photosynthesis, creation of sensible heat, evaporation, etc.). As in the atmosphere, some of the radiation received at the Earth's surface is redirected back to space by reflection. The following image describes the spatial pattern of surface reflectivity as measured for the year 1987. Figure 7f-4: Annual (1987) reflectivity of the Earth's surface. (Image produced by the CoVis Greenhouse Effect Visualizer). Reflectivity of the surface is often described by the term surface albedo. The Earth's average albedo, reflectance from both the atmosphere and the surface, is about 30%. Figure 7f-5 describes the modification of solar radiation by atmospheric and surface processes for the whole Earth over a period of one year. Of all the sunlight that passes through the atmosphere annually, only 51% is available at the Earth's surface to do work. This energy is used to heat the Earth's surface and lower atmosphere, melt and evaporate water, and run photosynthesis in plants. Of the other 49%, 4% is reflected back to space by the Earth's surface, 26% is scattered or reflected to space by clouds and atmospheric particles, and 19% is absorbed by atmospheric gases, particles, and clouds. Figure 7f-5: Global modification of incoming solar radiation by atmospheric and surface processes.